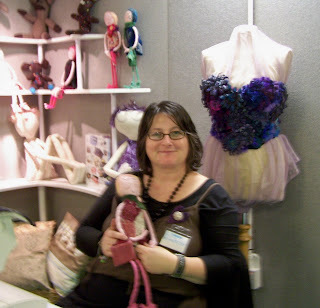 She will probably kill me for this....but I had to show the work of this lovely lady I met on Saturday at the Craft show in Brighton. 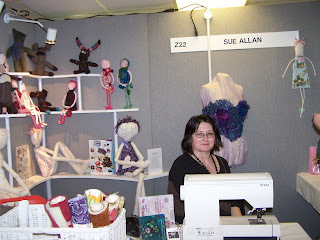 Sue Allan, who works under the name Sew Sister, is so enthusiastic and full of love for the work she is doing. She really helped me get some ideas going in my head of things I want to do. 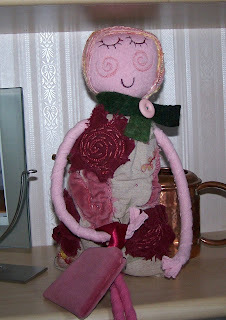 Her dolls are beautiful and if you have had a look at the Textile Directory, you will see they have her dolls everywhere! It is wonderful! Here is a sample of what she does. Unfortunately, you don't get a good view of the texture of these pieces. They are so wonderfully tactile and she was nice enough to let us know her secrets....this is the kind of stuff I love to do myself. 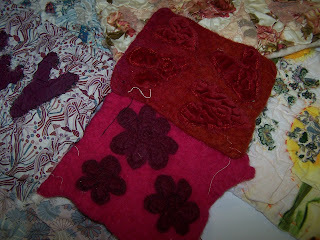 Take fabric and then embellish it until it becomes something else almost. Of course now I want to play with texture too!! 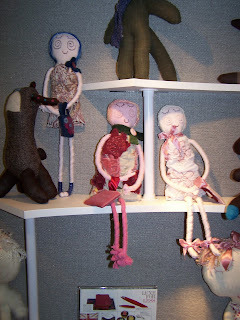 How cute are those dolls!!?? I love the one you bought, she looks like you!! I love the stitching on the rosy cheeks. Love the doll you bought.